I love to “tweak” recipes I find. Sometimes it works out, sometimes its a huge whalloping failure. This time though, it worked out for the best. Juicy, succulent and full of sweet, tangy, savory flavor. It started out with a little research. I was scouring Pinterest for a good pork tenderloin recipe. The ones I found varied slightly but were mostly the same. After trying the apple pork recipe thats been floating around and finding it to be painfully bland, I wanted to make sure that this roast wouldn’t go to waste. I took bits and pieces from a handful of recipes and added a few things to make the recipe my own. Here’s the recipe I decided suited my tastes. 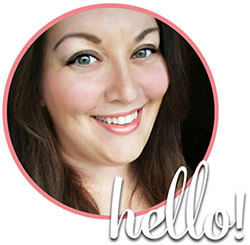 Feel free to improvise and substitute as needed! Mix all ingredients. Place pork in slow cooker and pour mixture over top. Cook on low 6 hrs or until tender. Remove roast and allow to rest 10 minutes before cutting. I cut mine and placed it back in the slow cooker with the sauce to warm until ready to serve. You could also add a little cornstarch/water mixture to thicken the sauce and serve over the meat. 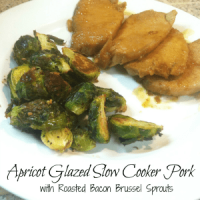 Serve with your favorite side dish or the Roasted Bacon Brussel Sprouts. Preheat oven to 400 degrees. Slice Brussels sprouts in half, put into medium mixing bowl. Melt the bacon fat back to liquid form (either running jar under hot water, or microwaving a few seconds at a time until liquid). Pour over sprouts. Add all seasonings and toss to evenly coat. Place in a single layer on a baking sheet and bake for 25-30 minutes or until browned and crisp on top. My husband HATES Brussels sprouts, and even he loved them. In fact, he loved them so much he took the leftovers to work the next day for lunch! If you try this recipe and you improvise any ingredients, let me know in the comments so we can try your variation next time! 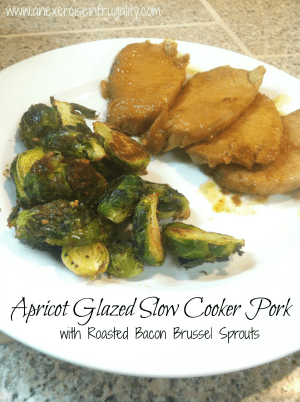 What do you think of the Apricot Glazed Slow Cooker Pork?